If you find yourself constantly drawn to Google and doing searches to try and find where your site is ranked in its results pages, then the tools in this article will save you a lot of time and effort. They will also allow you to check and monitor your site’s position in the search engines for specific keywords, and in some cases get updates sent directly to your inbox. For those that are putting in any amount of effort to improve the visibility of their site in the search engines, either via on page SEO, back linking, social media marketing or content marketing, using one of these tools can be highly beneficial. If you want an easy way to see if your hard work at promoting your site is paying off, then being able to automatically track your site’s rank is essential. These site rank checking plugins for WordPress allow you to check the position of the pages of your site, from within your site’s admin dashboard. The level of convenience that results from not relying on a third party application comes with a trade off against some of the more powerful features of the desktop applications out there. However, some of them do a good job at keeping tabs on your targeted keywords. I’ve been using this premium plugin for a few years now. It’s still running in the background, automatically checking the position of my content in Google for the keywords I’ve specified. Once installed, you can enter the keywords you want to use to check the position of your content. The regular license only allows you to check 100 keywords, while the developer license sees this increase to 500 keywords, plus a few other extra features. When you access the plugin dashboard from your WordPress admin area, you get a quick overview of how many of your keywords are ranked number one or on page one. 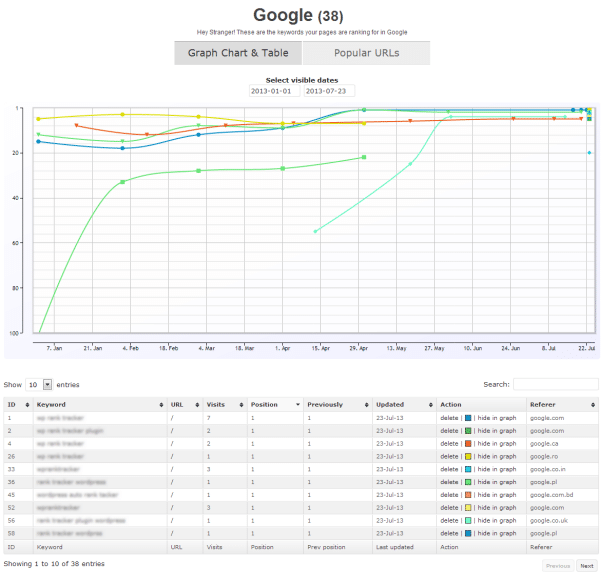 The keyword results are shown in a table and their position is shown for both Google and Bing, along with the date the records where last updated. Historical data is available for the keywords you are tracking, although there is no easy way to export them into a spread sheet for easier to read analysis. The plugin requires a cron job to be setup on your hosting server to perform the check automatically. However, this is easy to setup and the plugin comes with an easy to follow video walkthrough on how to do it. If you want a plugin that you can set and forget, and will continue to check the position of your site and its content in Google and Bing for the keywords of your choice, then this is a good option. 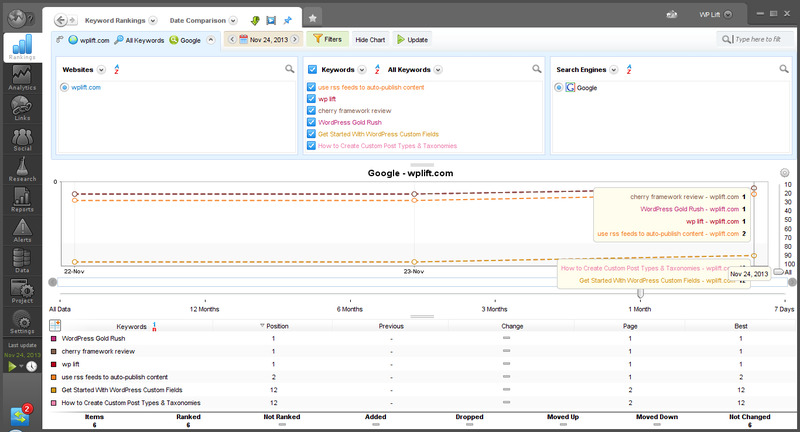 This is a premium plugin that will check the position of your site’s pages for certain keywords in Google. Despite the dubious looking sales page for the Rank Checker Plugin, it does have some good features, but it also makes a large omission which makes it hard to recommend. Once the Rank Tracker Plugin starts collecting data, it records any keywords that have been used by people to find your site. 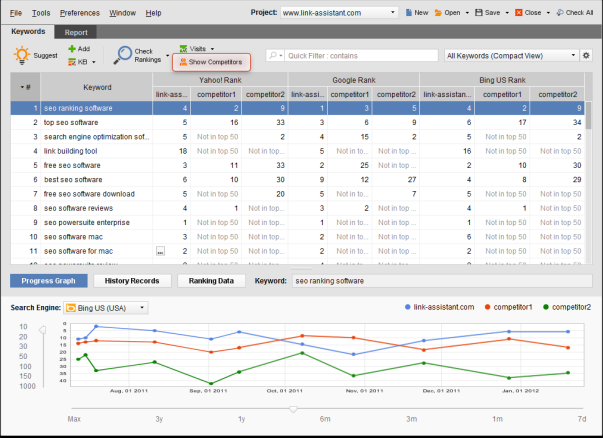 The plugin then begins tracking the position of your content in the Google results pages for those collected keywords. This is all done in the background and you can opt to have the ranking data emailed to your at a frequency of your choice, or just view it in your WordPress dashboard. As the plugin automatically builds the list of keywords to track in this way, the idea is that you are then only tracking keywords that people are actually finding your site with. However, it also means you can’t check keywords of your choice, including ones you want to rank for, but are not yet doing so. This is seems like a massive oversight, as being able to check the progress of your content and how it is positioned in Google is one of the essential ways to measure your optimisation efforts. Unless you are only interested in tracking the keywords you are already ranking for and getting traffic from, then this one is best avoided. This is another premium plugin that works in the same way as the above Rank Tracker Plugin. Again it only checks the position and rank of keywords and search terms that you are already getting visitors from, rather than letting you enter the keywords you want to check where your content is ranked for. However, it is also gives you some more information about your content such as the number of social shares, backlinks and the Google Pagerank of each page on your site that it is tracking. This is a free and very basic option that allows you and your readers to check the position of particular keywords for any site in Google. Once the plugin has been installed and activated, the only way to use it is to display the checker on a post or page using a shortcode. Then it’s a case of visiting that post and entering the keywords you want to check the position of in Google. This plugin is definitely lacking features, but if you want a very basic way to check keywords on demand, without leaving your site, then it is an option. 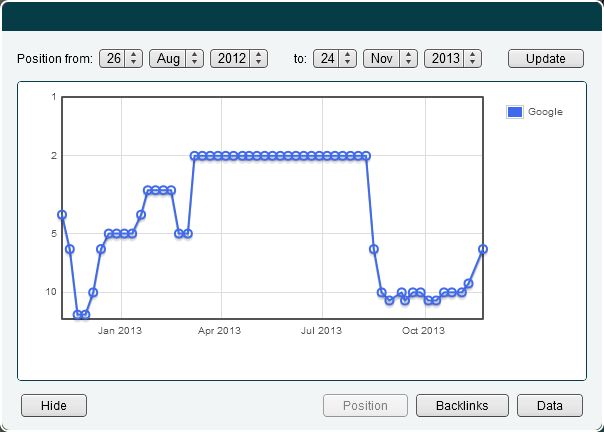 A number of the popular keyword analysis tools now include rank checkers. While these aren’t plugins and are desktop applications, they can of course be used to check the rank of your WordPress sites. If you are carrying out any keyword research, in order to help you decide which keywords to focus your content around, one of these tools can be a big help. This is probably the keyword research tool of choice for anyone wanting to plan in advance which topics to write about, and which keywords to focus on. But as well as being a great keyword research tool, it also comes complete with a rank checker for finding out which page your content is listed on in the search engine results. 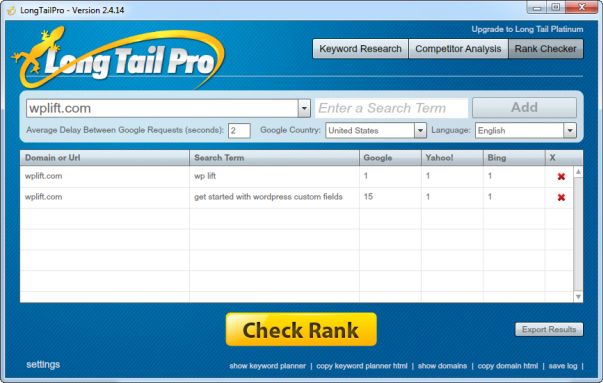 The Long Tail Pro rank checker is very easy to use. Simply enter the keywords you want to check your site against, and let the app do the rest. This is another application that is primarily a keyword research tool but one that also has a rank checker built in. While Long Tail Pro now gives it a run for its money as the number one keyword analysis tool, the Market Samurai rank checker is more useful. The ranker checked in Market Samurai works in the same way as LTP, in that you enter the keywords you want to check. However the check can be set to run on a weekly basis in the background, even if the app isn’t open. You can also choose to get an email reminder each week once the report is ready. Other features include the ability to view historic data for each of your keywords and view the accumulation of backlinks pointing to your content. If you want access to more advanced features and improved reporting, then you will need to install a desktop application that has been built especially for tracking website rankings. While there are many to choose from, here are two of the most popular options. This application does a great job of tracking lots of metrics about your site and those of your clients and competitors. It’s very easy to get started with, simply create a new project, enter the site URL and then enter the keywords you want to check it against. You can choose from multiple search engines and regions to check, and the data is all presented in a professional and easy to interpret way. Advanced Web Ranking is a professional solution for anyone concerned about where their sites are listed in the search engines, as well as other metrics to gauge their popularity. It’s not free but there is a 30 day no risk trial available so is definitely worth checking out. This rank tracker is part of the SEO Powersuite of tools for evaluating and monitoring websites. It allows you to check the position of your site in Google and Yahoo plus many more search engines. It runs on auto-pilot so once you’ve set it up, you can let it run in the background and come back and see the how your site has performed for your chosen keywords over time. Rank Tracker is a good and affordable choice for anyone looking for a powerful set of tools for monitoring a websites ranking. It’s not as feature packed as Advanced Web Ranking, but it is also offers 30 day no risk trial, plus a limited free version. If you’ve had enough of trawling through search engine results pages to the double or even triple digit page numbers, in search of your site, then the tools covered here can help you save lots of time and effort. While the rank tracker WordPress plugins are a tempting option, as they let your check your site ranking information inside your site’s dashboard, they are lacking in useful features. The rank checkers of the keyword tools, such as Market Samurai and Long Tail Pro are a good compromise, with the checker of Market Samurai being a very useful tool. However, if you want the best of the best, then a tool like Advanced Web Ranking is an impressive application that can tell you everything you might ever want to know about how your site is performing in terms of search engine visibility, social shares and backlinks. However, this tool can be pretty addictive and end up being almost as time consuming as checking your site’s position manually, thanks to all the informative data it can provide. Whichever approach you take, these tools are a good way to see if your online marketing efforts are paying off and improving the visibility of your site. Though I reckon you missed a big one semrush.com. 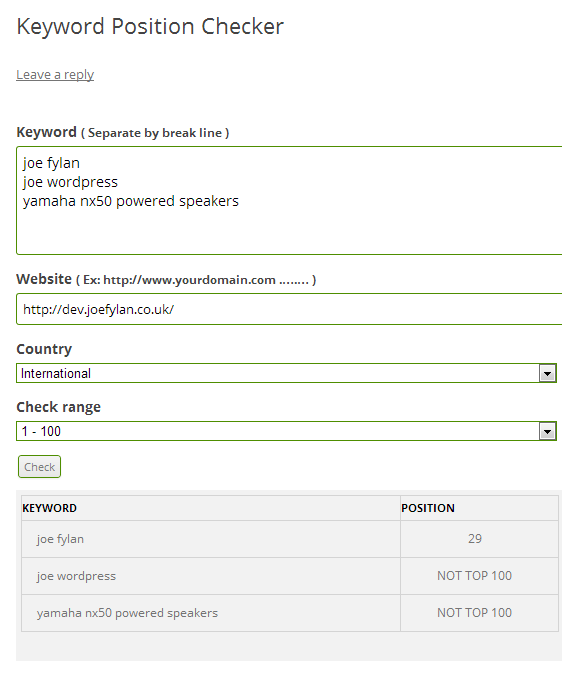 They just released their keyword position checking tool and I am exceptionally impressed – went Pro as an Xmas present to myself! I would be a little bit anxious to install plugins like this on my “main” site, as probably automatically checking for site position is not something that Google would approve. Also, when it comes to Google they provide all the keywords you rank for along with impressions and clicks in the Google Webmaster Tools, i guess it is best to start with it as this tool is free and already collects this data :).